Today I can say that for four days many companions have asked me in many different ways the question of who is Arturo Sosa? Never have I had to talk about a person so many times, and, especially, in English. It was the repetition of a personal history, that the more it was repeated, brought to mind new memories; and at the same time a serene interior conviction that this was someone whom I could see as General. When I was in the Novitiate and in Philosophy, he was a Jesuit who was admired for his ability. Already in those days he was a person who resonated in the Venezuelan news media. He was our professor of political philosophy. He was close to his students but at the same time demanding. For the second year of my regency (a period of time in which Jesuits are integrated into the apostolic life of the Society of Jesus and in some cases, such as mine, also do special studies, which for me was Law) I was sent to the Manuel Aguirre Community where Arturo Sosa was my spiritual director for four years. This allowed me to get very close to him and discover the spiritual depth of my namesake. I recall the community liturgies where we shared the Word and our experiences, in a community made up of five or six members. In those liturgies Arturo expounded on his close relationship with God as father (even using the term papa), as merciful and as the God of the history of our people, who invited all to read the signs of the times in the life of our people. I am reminded of his Sunday masses in the Church of La Pastora (a parish of Caracas) where the whole community shared the homily which he would finalize with a sort of a synthesis and personal comments. He taught me to look at God with the eyes of the poor, with serious analysis so as to understand the reality that surrounded us, to see in the history of our country a way to understand our present and find paths to the future. The analyst Arturo can be read superficially from the phenomenological exercise of description of realty and of propositions, but those who know him know that there is much more. Between the lines is a desire to search for and find signs of God’s invitation in our time, readings about the ways that allow us to enter more profoundly into human transcendence, and search for the same transcendence of the history that we are living. I would say that he taught me the meaning of a faith that is incarnate. This incarnate faith can be found in his writings and in his intellectual seriousness, but even more in his ability to relate to and come close to all, especially those who are most humble. In La Pastora, the poor live in gutters and there he found a road to commitment. Our house was open to all in the community of the poor that surrounded us, the people of the gutters, and especially to the youth of our sector. Arturo had many friends. That is why he didn’t speak simply from books but from the heart of the people around us. Later it would be about the Venezuelan frontier, but this is a story I will describe later on. When I finished my studies in Law and my experiences as a regent, I discovered that not only was I moving, but my namesake was also. He was to be my superior in Theology. He had accompanied me for a year there, when it was announced that he had been appointed Provincial of Venezuela. It was in 1996. He would continue as Provincial until 2004. During this time, he gave the Venezuelan Province a process of discernment that allowed us to construct the Apostolic Plan of the Province which we have until this day. A plan with a vision for twenty years. Really it is hard to believe that in a Province such as Venezuela, where everything is in constant change, we were able to be guided by a plan in which we all easily recognize ourselves all the time. The Plan’s options continue to clarify our work and especially the will to work in collaboration with others, men and women, that we consider that the apostolic subjects of the Province (laypersons and Jesuits) are open to the need to work in network. Part of this plan is the desire to collaborate in the constitution of popular organizations and civil autonomies which can be the subject of the Venezuelan political, social and economic process (a task that is much more complicated today than when we began). It presents the exercises as a gift we have received; and strives to strengthen laypeople and young persons as subjects in our church. In this plan it is clear that we want to commit ourselves to the poor of our country and the theme of frontier makes its appearance. We are talking about a novelty in our time. We had presence in Alto Apure (Guasdualito, El Nula, La Victoria, El Amparo y Ciudad Sucre). The challenge was accepted to work on the frontier in works that were on the human, apostolic and social frontier. The reality of the refugees, the presence of irregular groups of distinct signs, of legal and illegal commerce, especially of gasoline, the reality of the farm workers and of other elements, constituted a call for the whole Province (parishes, Fe y Algeria, SJR and others). Arturo at the end of his term as Provincial was assigned to the Catholic University of Táchira (on the border) and he was determined to make this a border university on the frontier. I knew Arturo when he was in one of his best facets of creativity and integration. He received a university of 9,000 students, which meant the creation of a new campus at a time when Venezuela had clear signs of crisis in sectors of production, hidden by the wealth of oil. He went to a university that was a good school, but that only looked interiorly into itself; and he opened it to the reality of the frontier by bring it into contact with neighboring communities, with the dioceses, with our frontier parishes, with the schools of Fe y Algeria in the area, with the reality of refugees, with the world of the farm worker, etc. A relationship that included investigation and publication of data about the area but also continued on to a direct commitment with actions aimed at change. 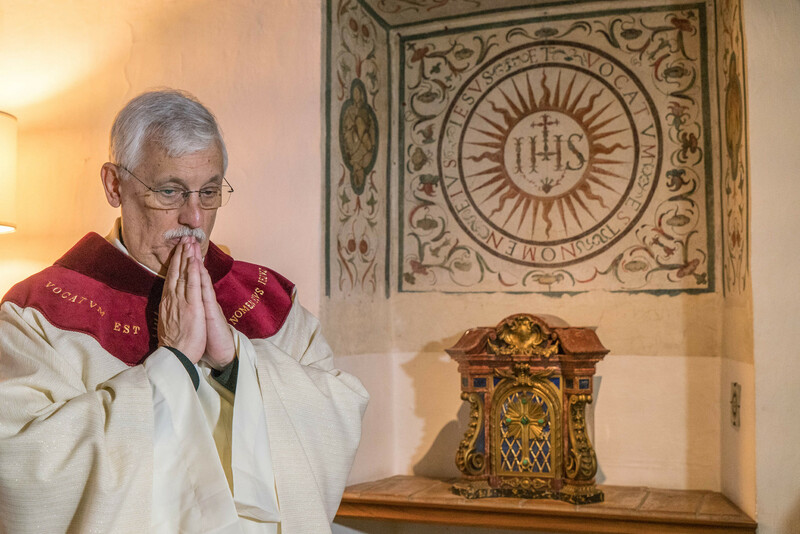 It was a change that he accomplished with the whole Jesuit community that accompanied him in the area and with many lay persons who in many ways shared and joined this dream. From this change was born the Interprovincial Apostolic Frontier Network (RAIF in Spanish). I participated in its formation as a newly appointed Provincial. This network brought together the Venezuelan and Colombian Provinces to address our common border in terms of living evangelization which recognizes the subjectivity of those who live on our borders. Arturo, with all his obligations (among which was to be Counselor to Fr. General Adolfo Nicolás, Rector, and Superior of the community), took on the responsibility of motivating this Network. And as he did before with the Province, he now convoked diverse pastoral agents from both sides of the border to dream up a plan, a path, that would unite us. And he did that even at a time when relations between the two presidents (Hugo Chavez Frías of Venezuela and Alvaro Uribe of Colombia) were very tense. But I don’t want to forget a very human detail. While all of this was going on, in the Peter Faber Community (that of the University where Arturo was superior) there lived an older Jesuit who had been an excellent theological professor, especially in the area of Christology: José Cruz Ayestarán. Unfortunately, he was not of sound mind. But instead of sending him to our infirmary, Arturo assumed the task of accompanying Jose when possible and allowed him to stay in the community. Each day Arturo would prepare the pills Jose had to take and make sure he took them. He was able to smile at some Fr. Jose’s impertinences, which his condition produced; and he and the rest of the community made it a point to try to make him feel at home. At the same time Arturo was very close to the university students, to those in our parishes in El Nula, Ciudad Sucre, Guasdualito and their villages, to the laypersons who worked in Fe y Algeria. It was his way of expressing that God, who is papa, merciful and committed. It was hard for me to accept (although there was nothing I could do about it) that the General (who had already on two occasions given him international posts) took him to Rome to direct the International Houses. It was clear that this was one of the priorities of the GC 35 and Arturo, as a good Jesuit, simply accepted. Among other things he had to leave his mother who at that time (2014) was 90 years old. He had always taken advantage of national meeting of Rectors to visit her, but now his visits were limited to once a year y by Skype. I want to recognize Margarita Abascal de Sosa for what she has done, which is a great deal. And so, these four days I have told this story several times, trying to communicate an experience and along with my brother Johnny Veramendi (elector from Venezuela who was the Pastor of Guasdualito) who has a lot to say, tried to honestly answer the question: Who is Arturo Sosa?